Midgard figures regularly into the early history of D&D because the two games were effectively cousins: two flexible fantastic medieval wargame campaign systems which developed simultaneously and shared some early adopters in common. 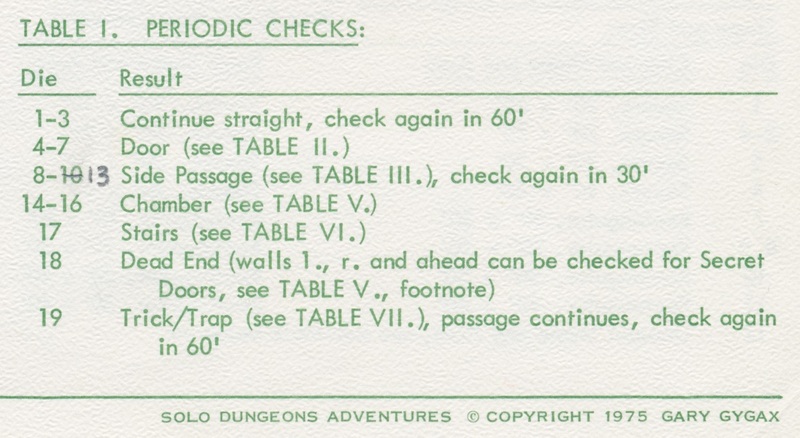 Scott Rich had a copy of D&D in hand by June 1974 -- his Midgard zines were among the earliest publications to mention it -- and Rich quickly began to merge its rules into his Midgard Ltd. campaign. Along the way, he corresponded with many D&D fans like George Lord. Lord had been pen-pals with Dave Arneson for some time; Arneson can be found participating in Midgard Ltd. in 1974 as well. ... a roll of 20, at the top of the next page, heralds a wandering monsters. 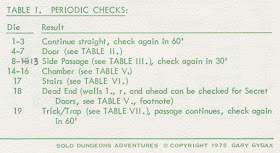 Gygax does retain the idea of exchanging envelopes for "special rooms" to introduce a bit of creativity to the process, but the focus of the design is on random generation: "through the following series of tables (and considerable dice rolling) it is now possible to adventure alone through endless series of dungeon mazes!" As the snippet from MS&S gives only Rich's perspective, he may have merely arrived independently at an idea Gygax was already exploring. Or maybe Lord relayed Rich's idea to Gygax, but he wouldn't have needed to, as Gygax received Midgard Sword & Shield himself -- in fact, Gygax even plugged Scott Rich and the Midgard Ltd. campaign in the second issue of the Strategic Review. Given how important the random generation of dungeons would become for solo computer gaming, we should extend some retroactive credit to Scott Rich, who at the very least got the idea into print first, and likely exerted some influence on its later development. A hoary chestnut pen and paper purists seek to crack even today, despite the several iterations we have seen throughout the years. I've spent the past year unwittingly recreating this (i.e., random dungeon generation mechanics/tables) for a dungeon delving miniatures wargame I am developing in my spare time. Interesting to see the old masters' take on it 40 years ago! It might be interesting to check whether any emchanics for sol dungeons bear any reembalnce to sole mechanics in (miniature) wargames. Don Featherstone's "Solo Wargaming" was published in 1973, and describes some mechanics based on envelopes to randomly select tactics to be followed by the opposing army. Definitely there are connections, especially given how more solo gaming was linked to postal gaming: you were receiving sealed envelopes from your opponent describing how you should move troops on your board, say. These practices go back to the early wargaming community of the 1950s, and they persisted in the D&D era: there was a great wargaming zine of the late 1970s called "Lone Warrior" that carried wargaming content specific to solo gaming.